hlx.com was buried yesterday, time to post some old artwork here before it gets forgotten. 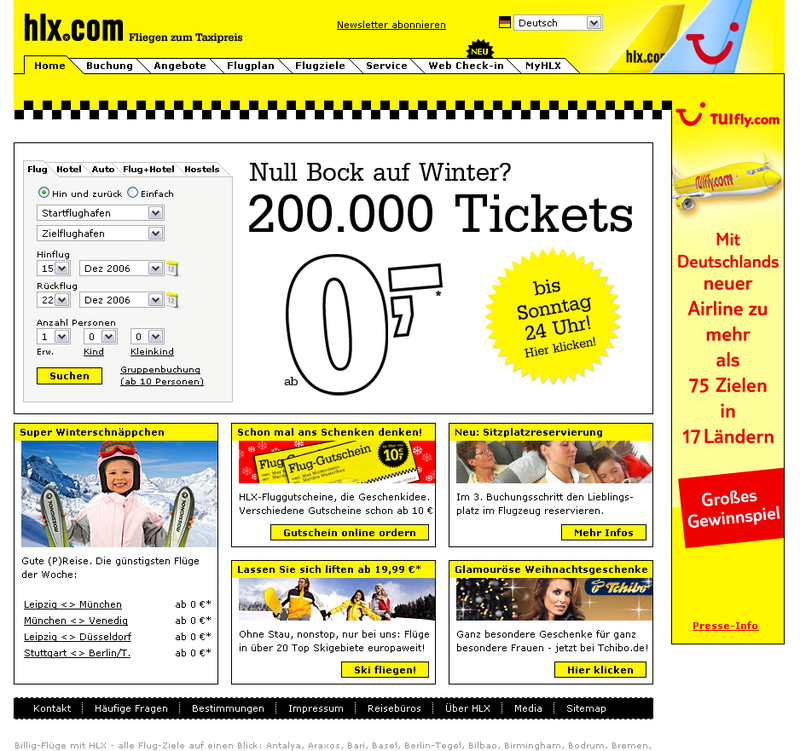 Hlx.com was a low cost carrier brand from the „Touristik Union International” corporation (TUI). TUI is the largest tourism company in europe. 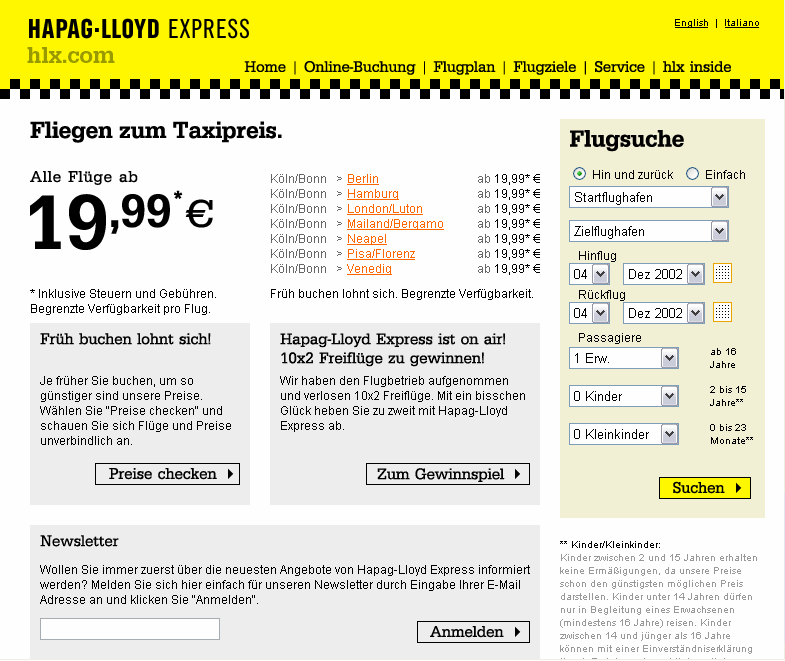 They now merged their two german low cost airline brands into a new one which is called tuifly.com. 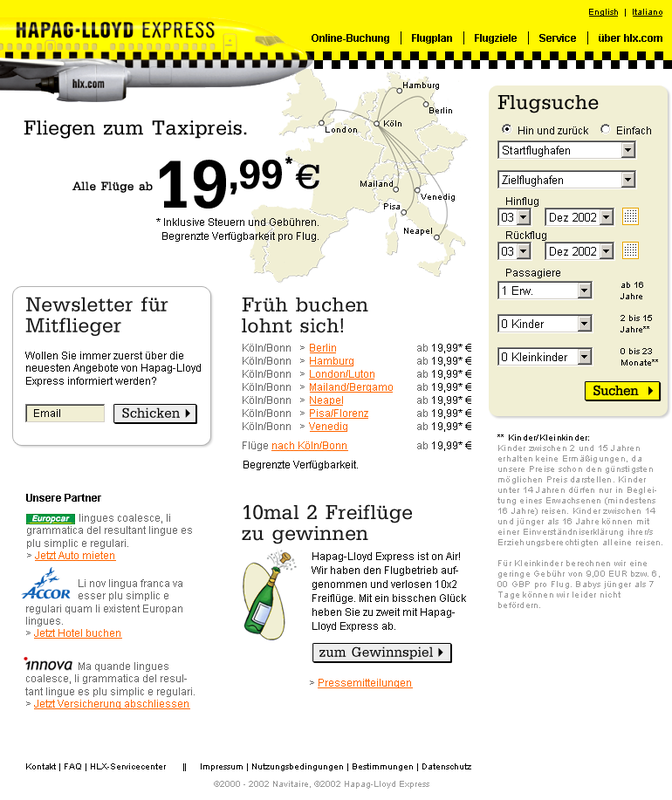 Here are screenshots from 2002 to 2006, retrieved from my personal wayback machine. For me, the 2003 version still is the best one… anyway. Hlx.com, cool project, rest in peace. Ahhhhh, those were the days. Yeah, I’d agree, Andreas tidied up all the loose ends of our launch design and made something better out of it. The relaunch in 2005 (almost completely Jürgen Brandenburg’s work) was something totally new, and also quite nice if you ask me. 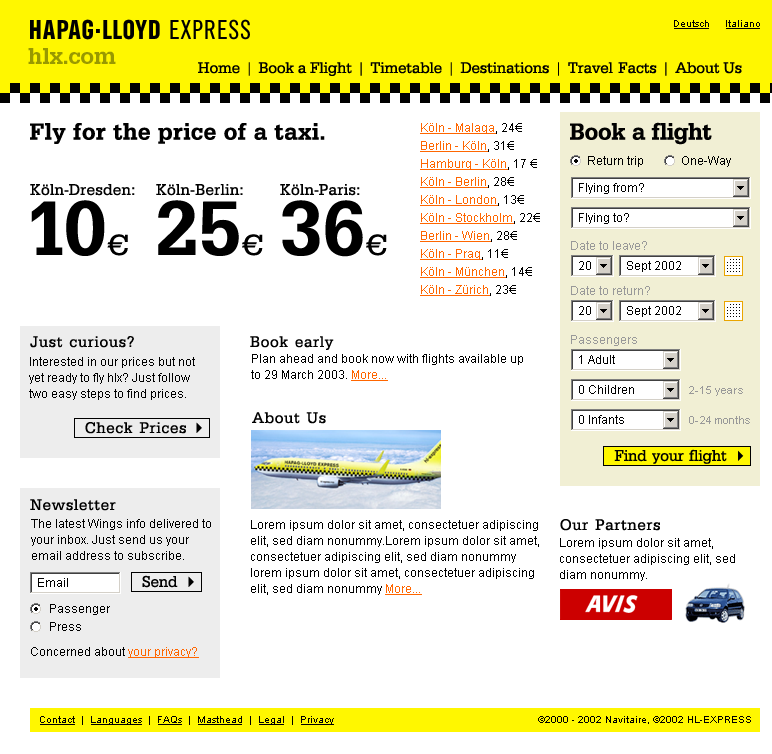 The Dec. ’06 screenshot you’ve got up there was close to the launch of TUIfly.com (death of hlx.com) and a little rough around the edges – sort of the collision of the past and the future. 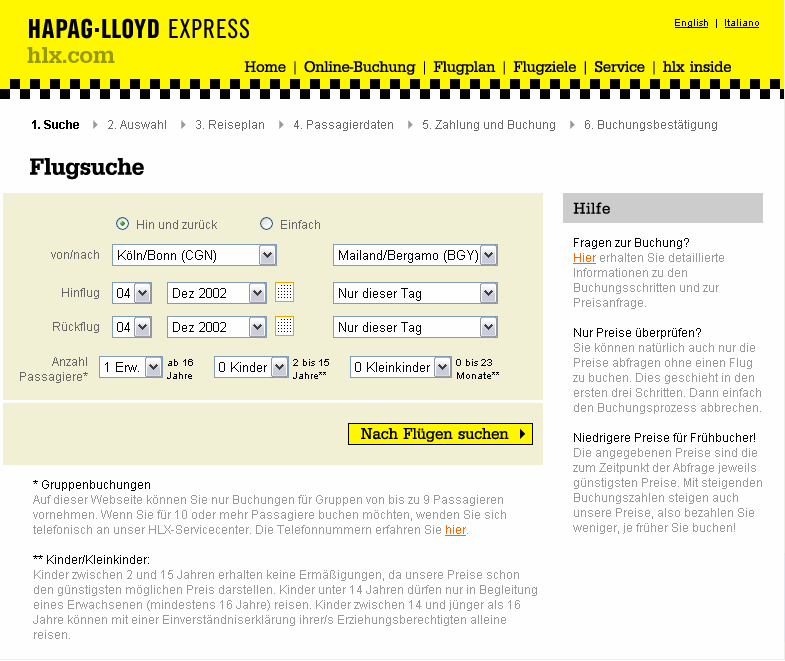 Ping me if you’re interested and I can send you a screenshot after the ’05 relaunch but before the collision. ping. my wackback machine didnt retrieve a 2005 screenshot. the grey was intentional, a feature not a bug. you don’t like it? hm . did you notice that you can click to enlarge? Heh, no worries, but to be exact, that’s how it looked a while *after* the relaunch. @matt you’re right, looks better without the grey background.